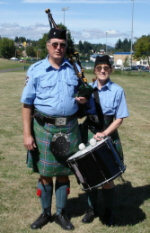 Tim and Penny McLaren of Vancouver, Washington, are members of the Fort Vancouver Pipe Band. Tim has been playing the bagpipes for about 15 years, after getting a late start in middle age. He is a founding member, and current President, of the FVPB which formed in 2000. Early on the band was in need of tenor drummers so several wives "volunteered", including Penny. Tim was the organizer for the CMSNA annual meeting in Portland in 2008 and is currently working on organizing the 2011 AGM to be held in Pleasanton, CA. In the 1980s, Tim was the Games Marshal for the Rocky Mountain Highland Games in the Denver, Colorado area. Penny acquired her Scottish background when she married into the MacLaren Clan. She has been very active and supportive and enjoys her adopted heritage, while still being proud of her own Czech background. The Czechs even have their own version of the bagpipes called "dudy" (see http://www.hotpipes.com/pipe0001.html). 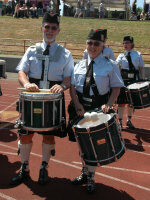 Pete & Karen Woodall are drummers with the Fort Vancouver Pipe Band (FVPB) in Vancouver, Washington.. They were made "honorary" members of Clan MacLaren after traveling with the clan during the Scotland tour in 2006. They have committed their membership by helping to host the 2008 AGM held in Portland. Laura Farmer is a drummer in Florida. She is also the SouthEast commissioner for CMSNA. 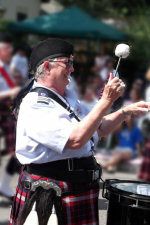 She has attended the North American Academy of Piping and Drumming (NAAPD) in North Carolina. Patrick competes frequently, recently at the 2014 North American Pipe Band Championships in Canada. Married to Dr. Latisha McLaurin with two children Calista and Elliott.